Burnt Orange Twilight, by Alex Suárez. Photograph ©2008 Alex Suárez. All rights reserved. In light of tonight's national championship game, here's a image that serves as proof-positive that God is a Longhorn. :-) The burnt orange glow on the horizon was just amazing that night. I took this photograph from the stands on October 18, 2008. 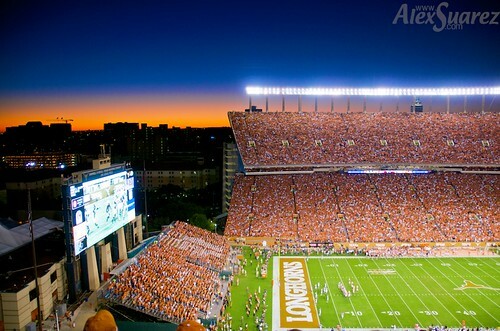 The then #1 ranked Texas Longhorns were about to score against #11 Missouri on a spectacular Fall evening in Austin, Texas. Oh yeah, the Texas Longhorns won that night, 56-31. Best of luck to the Texas Longhorns in tonight's big game.